Case Cutlery Clip Point Paring Knife, 3"
This handsome classic Clip Point Paring Knife is part of our Household Cutlery collection. It features a 3-inch stainless steel clip blade with a solid walnut handle and a full tang. The clip point blade excels at precision tasks like coring fruits and vegetables, cutting out blemishes, and removing stems. This knife make preparing food a breeze. This knife is constructed with Case Tru-sharp stainless steel which is a special high-carbon steel that helps the blades hold an edge longer than conventional steel. It also offers extraordinary blade strength and corrosion resistance. Comes packaged in a clamp pack. Made in Bradford, PA, USA from domestic and imported materials. The GOURMET 3" Clip Point Paring Knife is the second most important knife to have in the kitchen. This paring knife is designed for all close-hand tasks. The clip point allows the blade to easily carve and peel fruits and vegetables. The Wusthof Gourmet 3" Clip Point Knife features a clipped tip, making it an ideal blade for precise trimming and close-hand tasks. Stamped from high-carbon stainless steel in Solingen, Germany. Craftsmanship has been a tradition at Wusthof for over 190 years. Quality and precision have always been the standard that we measure our knife by and our Gourmet line of stamped German knives take precision to a new level. Each knife in this line is cut from a piece of steel using a laser beam to make a perfect blade. The Park Plaza knife collection is Messermeister’s stamped version of the triple-rivet, full exposed tang, German knife series. This collection is manufactured with one-piece, die-cut stamped blades using high quality German stainless steel alloy. The stamped blades do not have a bolster and are lighter than forged knives. Park Plaza knives are trimmed, straightened and hardened then attached to industrial quality handles that are buffed to a seamless fit and finish. Manufactured in the historical City of Blades, Solingen, Germany by cutlery artisans, these are a great value. 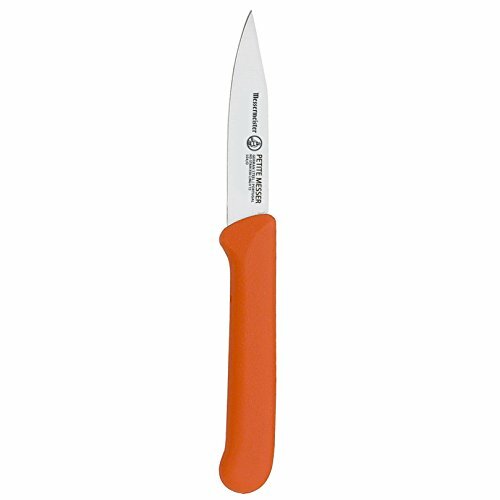 The Messermeister Park Plaza 3” Clip Point Paring Knife has an angled nose and a slightly curved blade that is ideal for small and precise cutting tasks such as peeling, coring and mincing. The compact handle fits comfortably in the hand and allows you to execute detailed and controlled cuts. Dexter-Russell, the experts in edges since 1818, offers all of the necessary tools to outfit enthusiasts in the hunting and fishing world. Choose the right tool, blade shape, edge configuration, and handle type to help process your catch. Each cutting edge will be sharp out of the box, long-lasting, easy to restore, and proudly made in the USA. Sharpening and storage solutions are also available to keep your Dexter knives sharp, protected, and ready to do the job. Clip point parer knife. 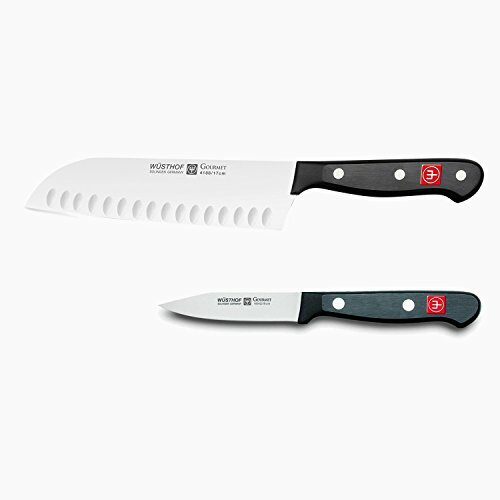 For chefs who want Dexter quality at its most affordable. Offers performance and value for commercial use. Features a stain-free, high-carbon steel blade with durable, slip-resistant polypropylene handle. NSF certified. The Gourmet 7" Hollow Edge Santoku Knife is designed with a thinner blade than the traditional chef's knife, at a 10 cutting edge, and gradually curves up at the very end providing a straighter edge. The hollow edge is crafted with evenly spaced vertical indentations, which create small air pockets between the blade and the food. These small air pockets gently push food off the blade and reduce friction and drag. This knife allows cooks to effortlessly prep a wide array of fresh produce, including starchy vegetables like potatoes, which tend to stick to a knife's blade. 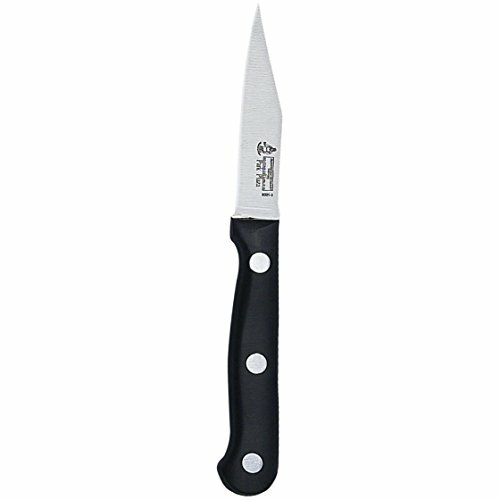 The Gourmet 3" Clip Point Paring Knife is the second most important knife to have in the kitchen. This paring knife is designed for all close-hand tasks. The clip point allows the blade to easily carve and peel fruits and vegetables. Ideal for peeling and coring foods or mincing and cutting small items. 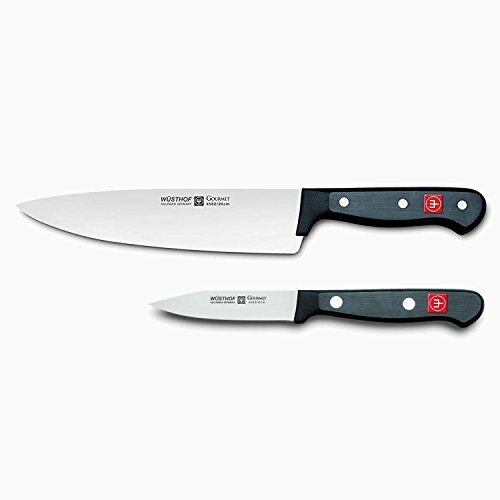 Meet all your kitchen cutting needs with this gourmet cook's knife from Wusthof. Precision-forged from a single piece of high-carbon stainless steel, the blade is 20% sharper with twice the edge retention thanks to Wusthof precision edge technology (Peter). The Gourmet 8" cook's knife is an indispensable all-purpose kitchen knife that can be used for chopping, mincing, slicing and dicing. Due to the weight and balance of the knife, it is also perfect for heavy duty work such as cutting thicker vegetables and meats. The Gourmet 3" Clip Point Paring Knife is the second most important knife to have in the kitchen. This paring knife is designed for all close-hand tasks. The clip point allows the blade to easily carve and peel fruits and vegetables. The Black polyoxymethylene (pom) handle is triple riveted for precise control. Tempered to 56 degrees Rockwell, this knife is incredibly sharp and easily maintained. BergHOFF Ergonomic Clip Point Paring Knife 3"